Today’s guest post is from Genera O’Reilly who attended the Young Yoga Masters Kids Yoga Teacher Training in February 2011. Genera’s been teaching adult yoga for years, but found she’s “a novice in the world of teaching yoga to children.” Find out what happens after the training, when she takes kids yoga out of the workshop and on to the mat. That’s her beautiful daughter Soleil in the pictures. I have been a yoga instructor for many years primarily teaching adults. However, recently I have changed my focus to teaching children’s yoga. I am also a mother of a four year little girl and so it is only natural progression that I would want to teach my daughter yoga being a yoga momma and all. Over the past year I began by teaching my daughter simple asanas and breathing techniques that I thought she would find fun and playful. Teaching children is a much greater challenge than I had expected. While I consider myself to be an experienced yoga practitioner, I realized that I am a novice in the world of teaching yoga to children. So, I thought it would be a great idea to get some formal training with someone who had some expertise in working with children. I was beginning to feel a little stuck with my yoga delivery. Then I found the lovely and enchanting Aruna from Young Yoga Masters and signed up for her children’s yoga workshop. 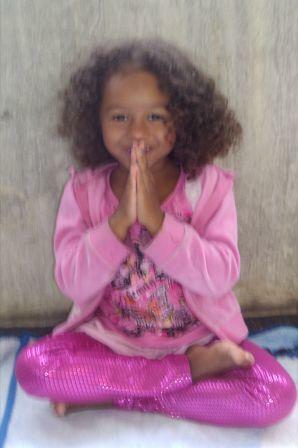 Soleil Meditating – Children enjoy meditating and the games we play are teaching moments to help them learn how to do it. I spent a full weekend learning many different meditation techniques, yoga games and various ways to deliver asanas to children. I had tons of fun. The group was very enthusiastic and had a wide range of experiences with children and yoga, everyone had something to offer. My favourite component was the meditation games and chanting. I was so eager to get home and try them out on my daughter and her friends. The following weekend that’s exactly what I did. I invited some of my daughter’s friends over to try out some of the new ideas I had learned from Aruna’s curriculum. The songs and games were a success. The kids really enjoyed the meditation game with the gremlins. Even a Four Year Old will Challenge! In fact my daughter won’t stop talking about how great the meditation game is. She did challenge me on whether or not it was meditation because the gremlins aren’t being quiet. LOL! You’ve got to love four years olds. The beauty of that meditation game is that it’s an excellent way for them to begin training their mind to be still and develop their concentration while having fun. The kids were very receptive to the game and also enjoyed the popcorn game. For those of you who do not these games you should check out Aruna’s yoga workshop because she has endless ideas. But the biggest thing to remember with kid’s yoga is to keep it fun, keep it open and keep it simple. Thank you Genera for giving an account of what it’s like after the Kids Yoga Teacher Training! Thanks also to Soleil for showing how much kids like yoga. If you’re looking for a kids yoga Teacher in Toronto please contact Genera at her e-mail. She’s got an expertise in yoga and a passion for teaching kids! June 18 – 19, 2011: Kids Yoga Teacher Training Weekend Course: Toronto, Ontario, Canada. This weekend is limited to 18 participants. Because the last course filled up I recommend registering early. Registration and information here. You can bring Yoga Yoga Masters to your area – This training is like no other! Contact [email protected] to discover the delightful world of kids yoga. Thanks again Genera – those are wonderful pictures! Soleil looks so happy in them. Clearly doing yoga with your kids can be a wonderful bonding experience.